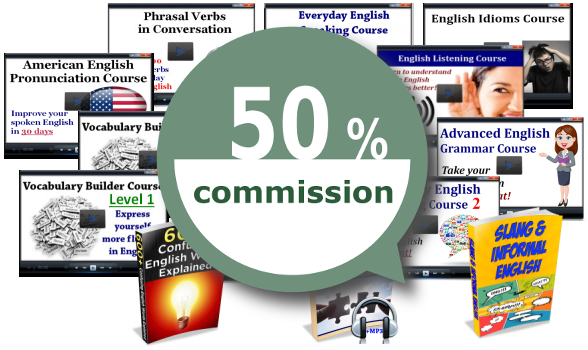 Promote Espresso English courses/E-Books and get a 50% commission! Do you want to refer new students to Espresso English, and make some extra money when they sign up? Partner with us by joining our affiliate program! After you sign up, you’ll get affiliate links that you can publish on your website or social media when you promote Espresso English products. When a student buys something using your link, you’ll receive 50% of the purchase. I’ll send you your total commissions once a month via PayPal. The affiliate cookies are valid for 180 days – so even if someone signs up months after they click your link, you’ll still get the credit. We are looking for affiliate partners who have websites, blogs, YouTube channels, Facebook or Twitter accounts teaching English as a Second Language or sharing English tips/lessons. We’d also love to work with English teachers or schools who want to refer their students to Espresso English materials. Please fill out the application below. If you are accepted, you’ll receive more information on how to use the affiliate system.